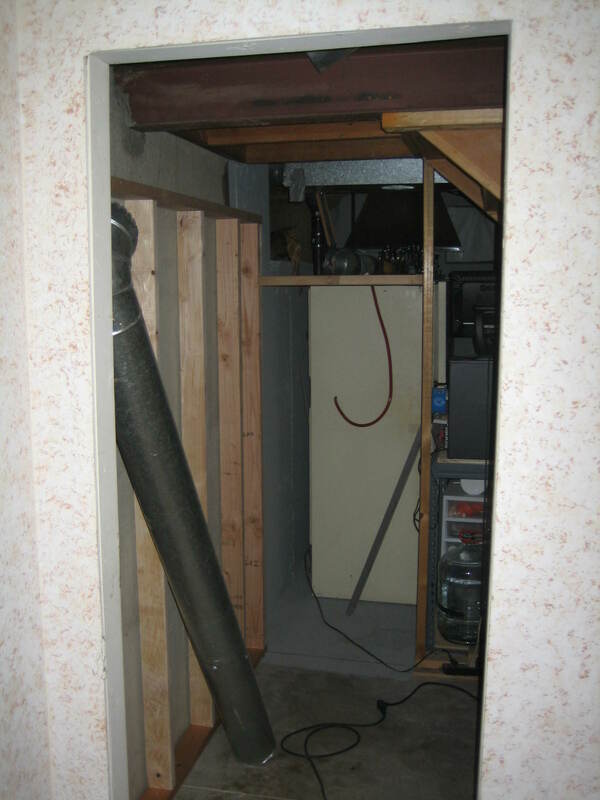 The green monster (the freezer) was set to blow hot air in from the top of the inside of the fridge, the air would travel across the coils, and exit the freezer unit into the bottom of the fridge. 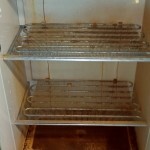 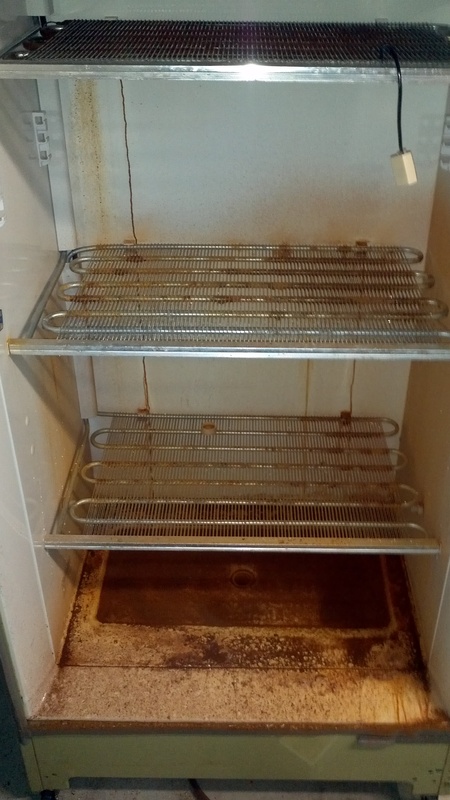 This worked really well for about a year until the freezer shelves/coils started rusting out. 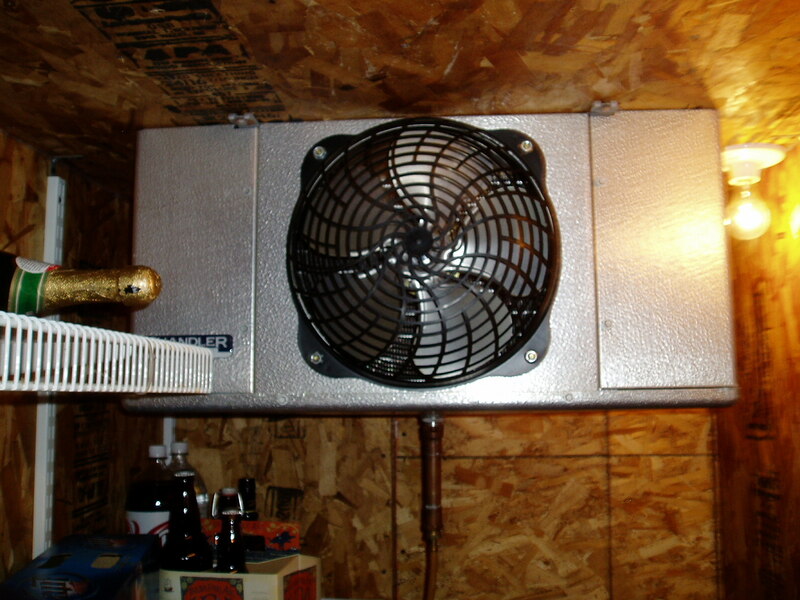 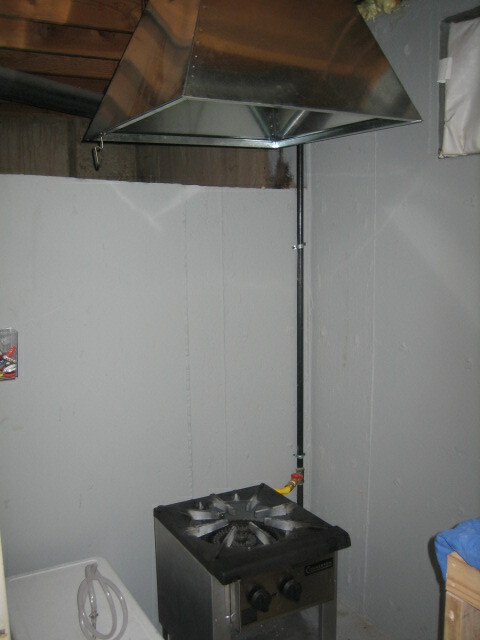 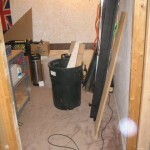 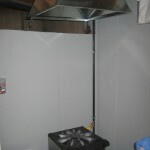 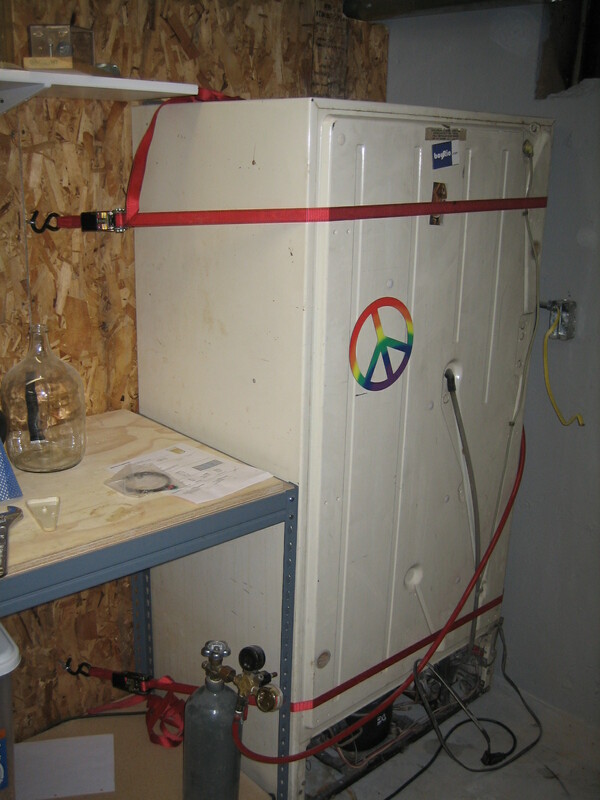 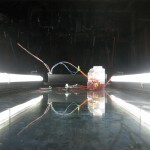 I was nervous that the unit would go completely and release all of its freon into the room. 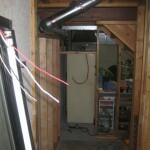 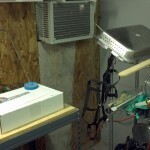 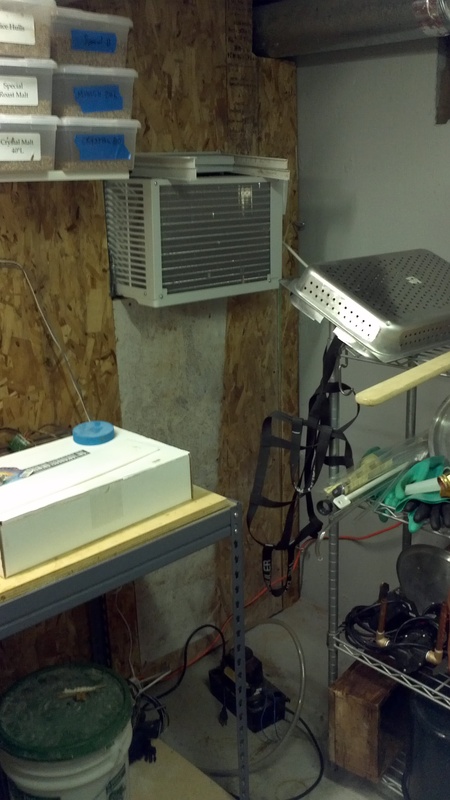 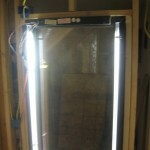 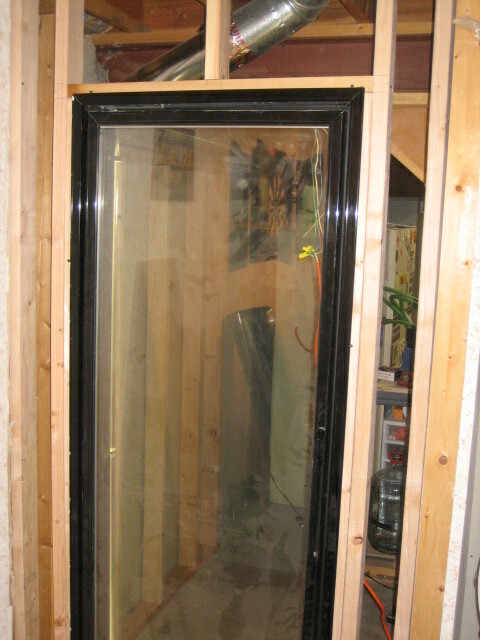 I removed the old freezer and replaced it with a standard window air conditioner unit. 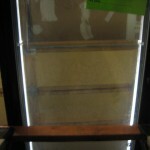 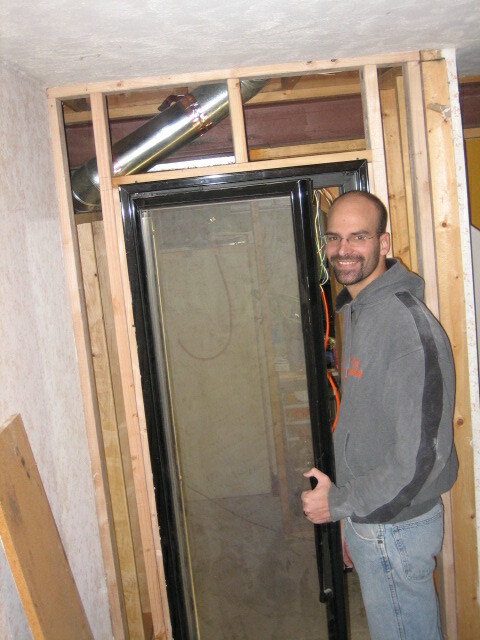 We had to swap out the refrigerator we were using to power the walk-in for an upright freezer. 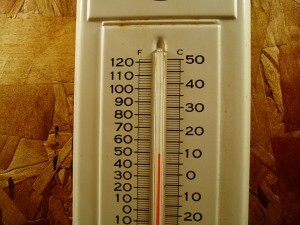 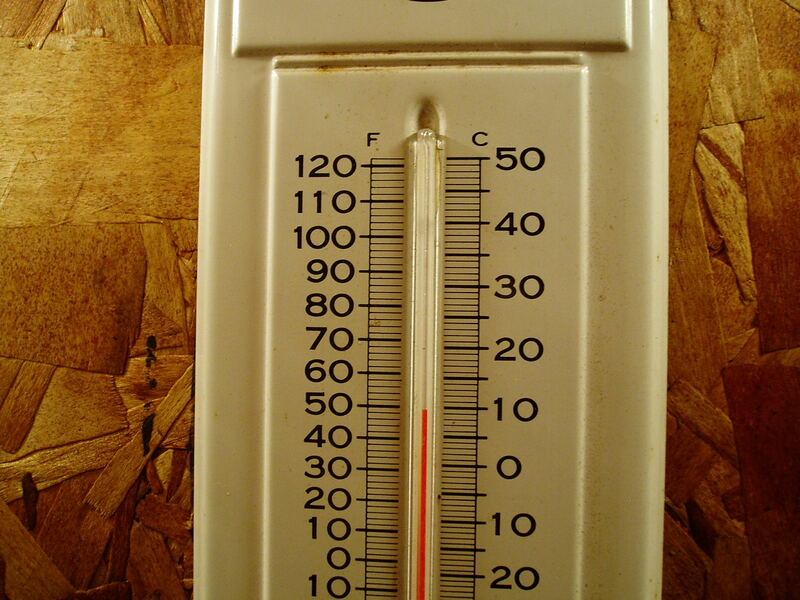 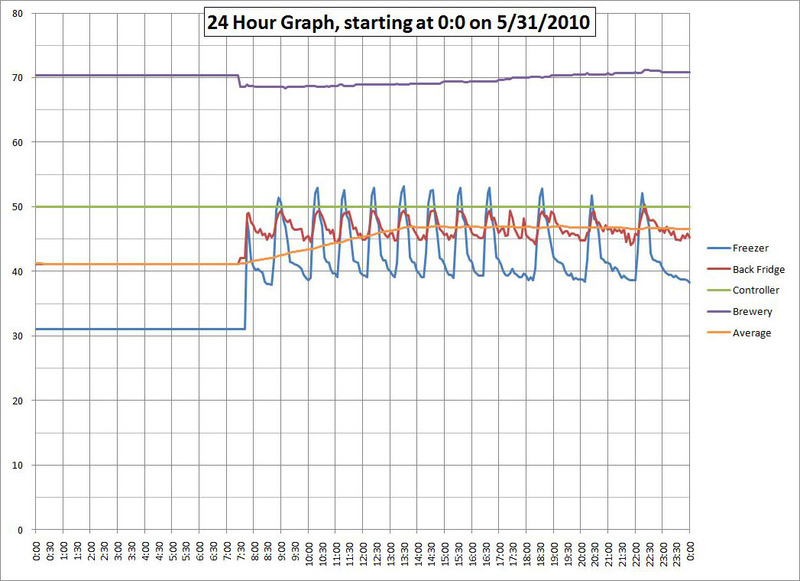 As you can see from the temperature graphs below, the fridge just couldn’t keep up. 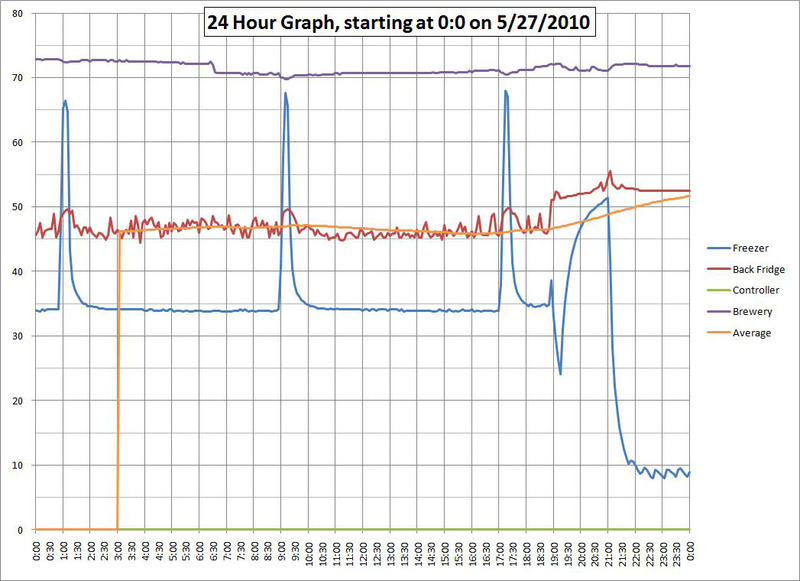 It was running for 8 hours straight, would shut off for 30 minutes, and then run for 8 hours again. 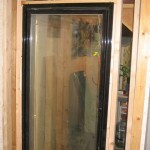 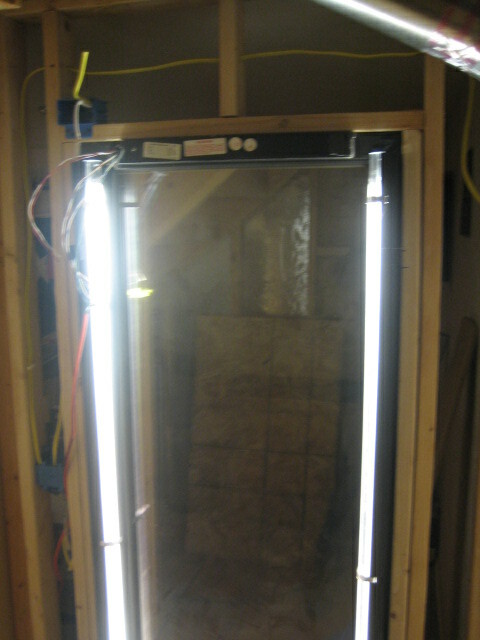 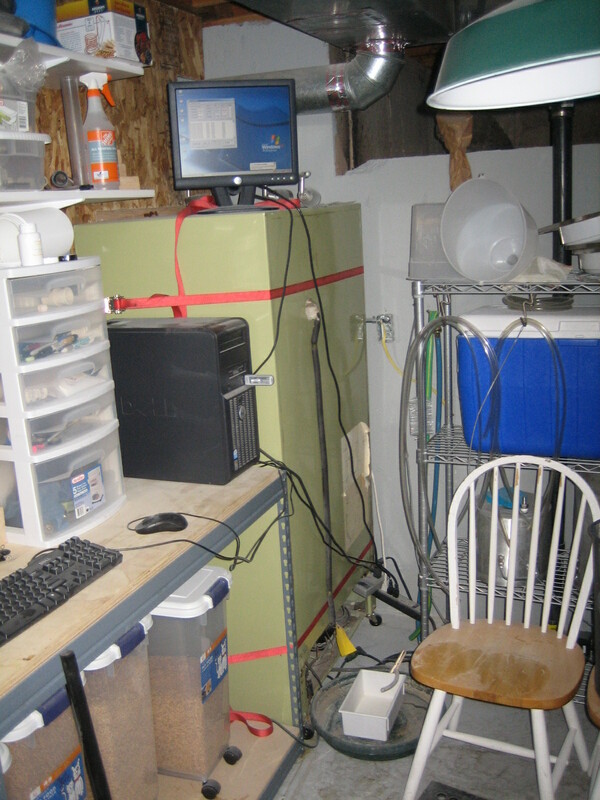 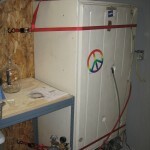 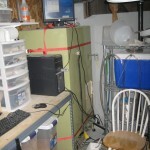 Now, with the upright freezer in place, it runs for about 30 minutes, and turns off for 30 minutes. 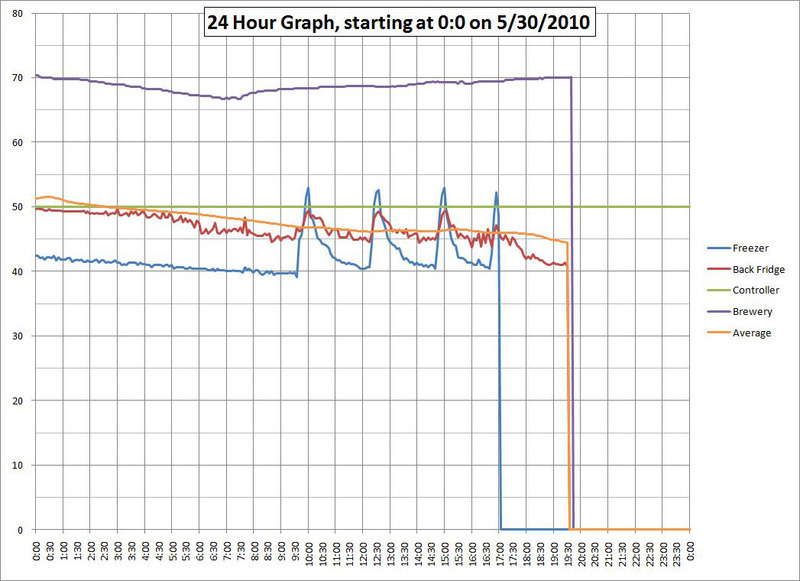 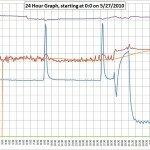 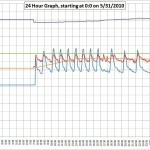 (The spots where the graph drops to 0 is when the data logger stopped working). 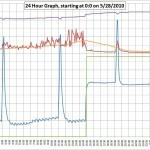 Each graph is one day, midnight to midnight. 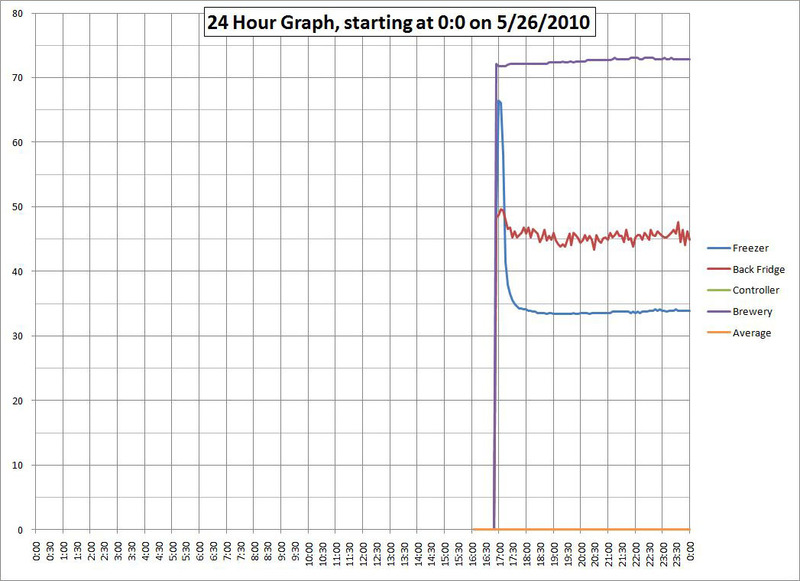 Finally, the unit is cycling in a normal manner… based on my measurements of the fridge before setting it up as a walk-in, this is how it should look. 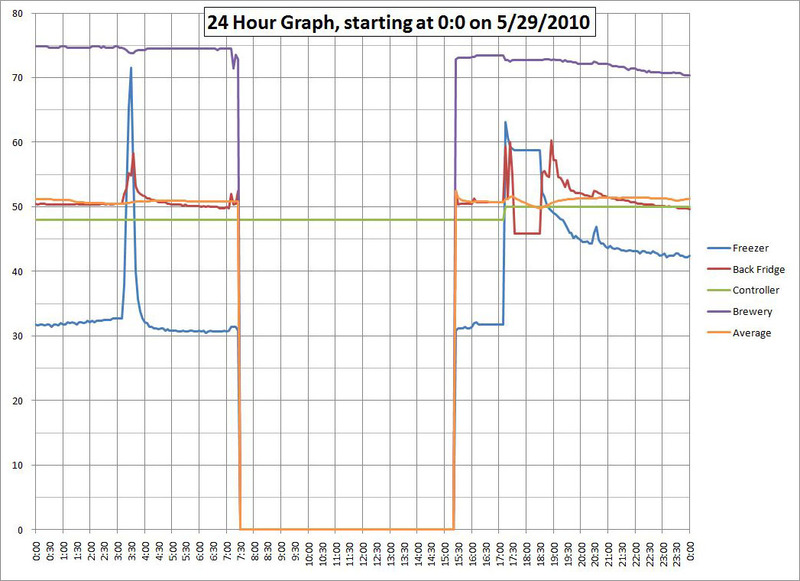 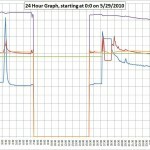 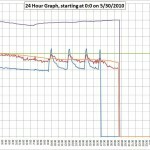 (The missing data on 5/29 is the switch from the Fridge to the Freezer unit, you can see on 5/29 and into 5/30 the time it took the freezer to cool off the walk-in and then on 5/30 the start of the on/off cycling. 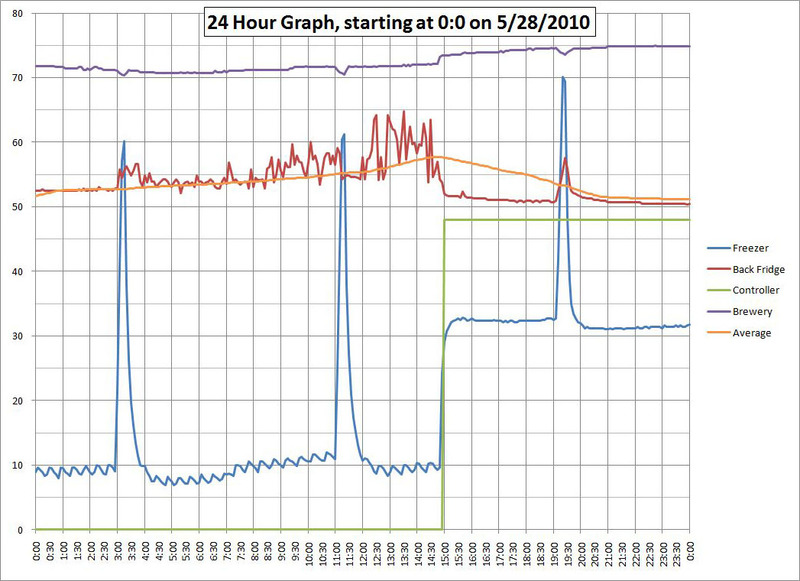 On the 5/31 graph you can see the on/off cycling moving closer together as the fridge unit gets closer to the ideal temperature, then as we walk in and out of the room, it warms up and the fridge runs longer to balance out. 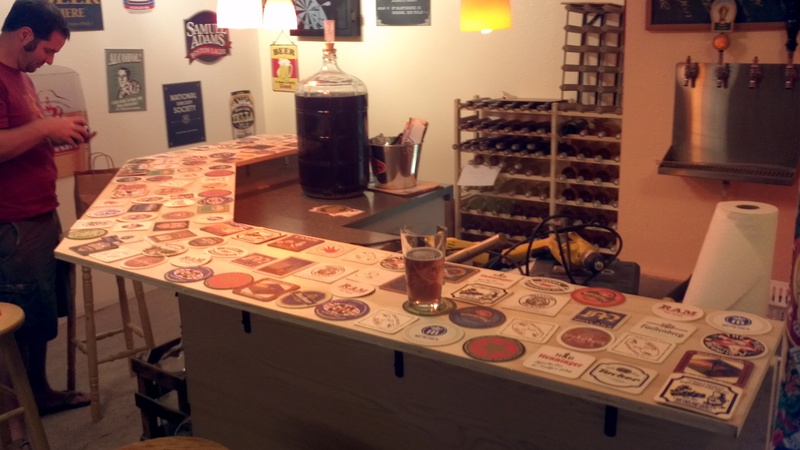 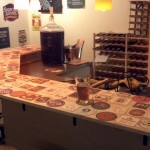 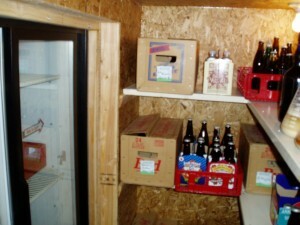 The first table is my baseline for my beer fridge as it sits right now, an old house refrigerator that we got for free. 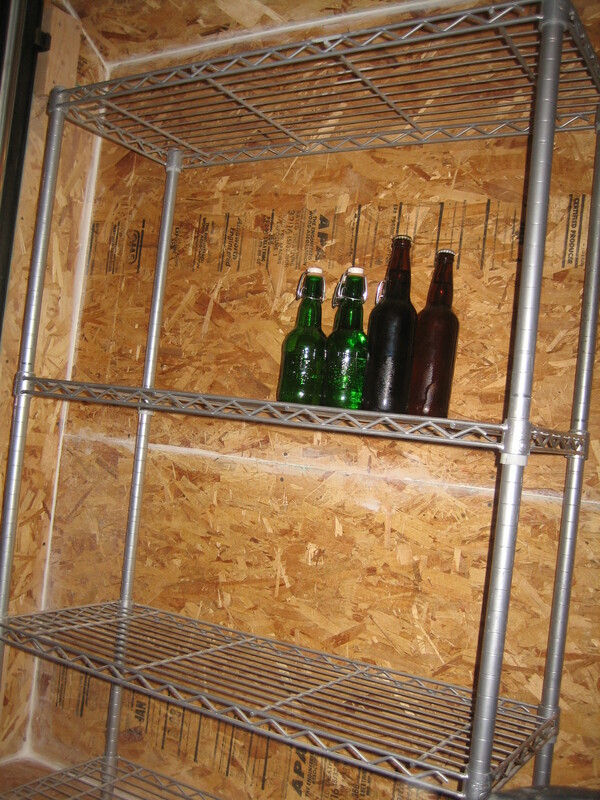 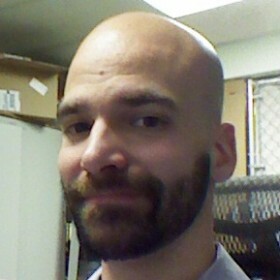 I have cleaned up the coils and such, took out the shelves, but otherwise unmodified. 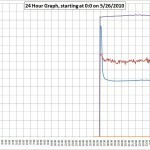 It runs under it’s own temperature controller and according to the thermometer I have in there, it is currently running at 38*f. According to my power bill, I get charged $0.055 USD per Kilowatt Hour (KWH); I have Xcel Energy in the Denver Metro area of Colorado. 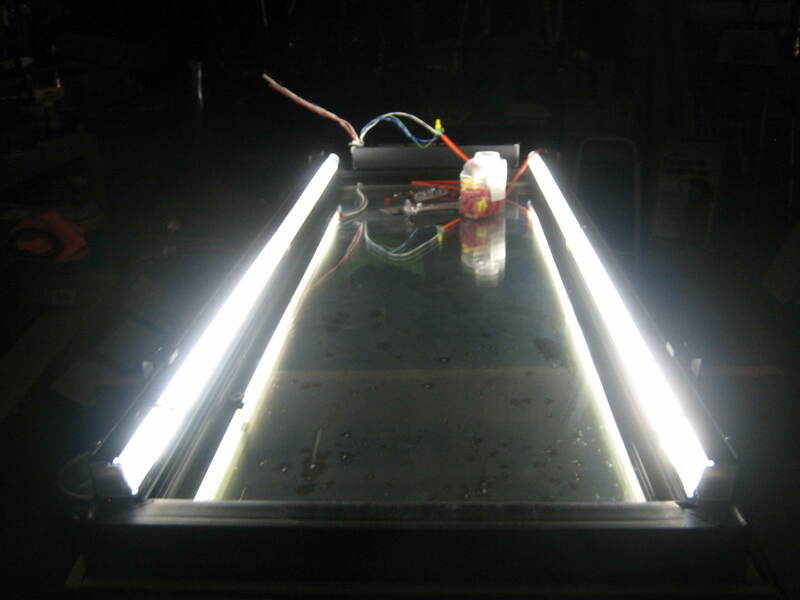 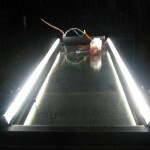 This second table will be the power usage after I take the refrigerator doors off and push it up to the opening in the walk-in to use it to power the walk-in. 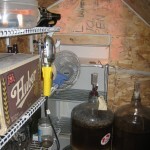 I plan to let it run as long as I can practically empty, and measure it. 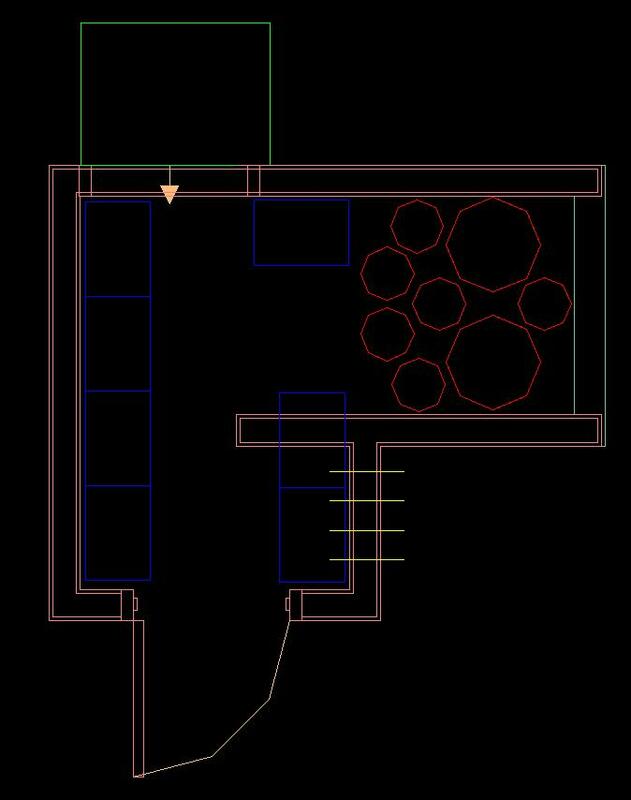 (This idea was scrapped due to the fridge unit not being able to keep the room cool enough, so I moved on to testing stage 2: fill the room with water to help is save power). 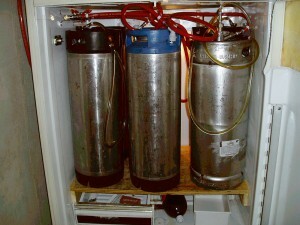 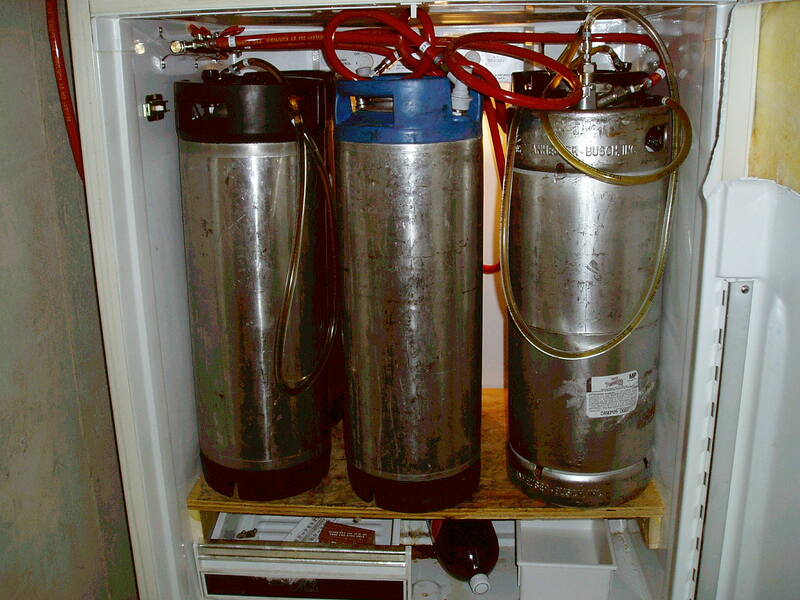 Then I will fill the space with as much liquid as I can (beer, kegs, carboys, etc), even if it is just with water, to see the difference in power usage keeping the fridge full vs empty. 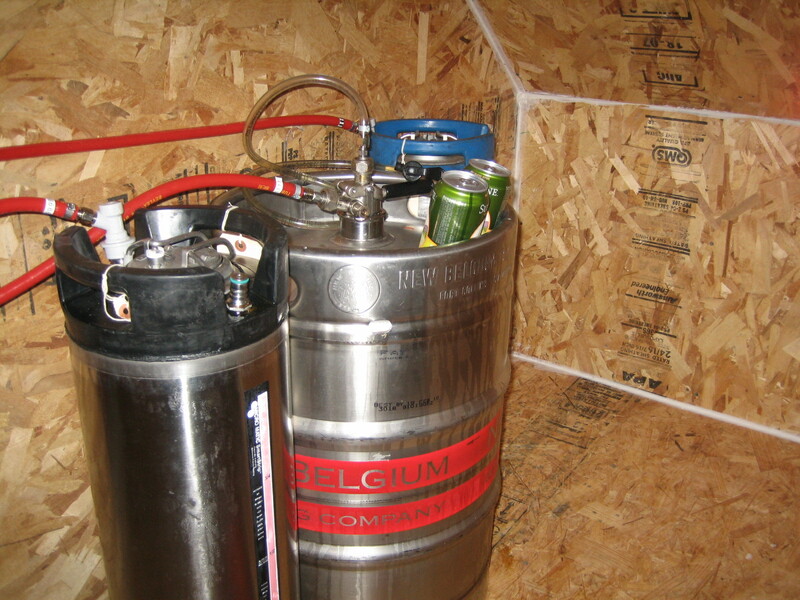 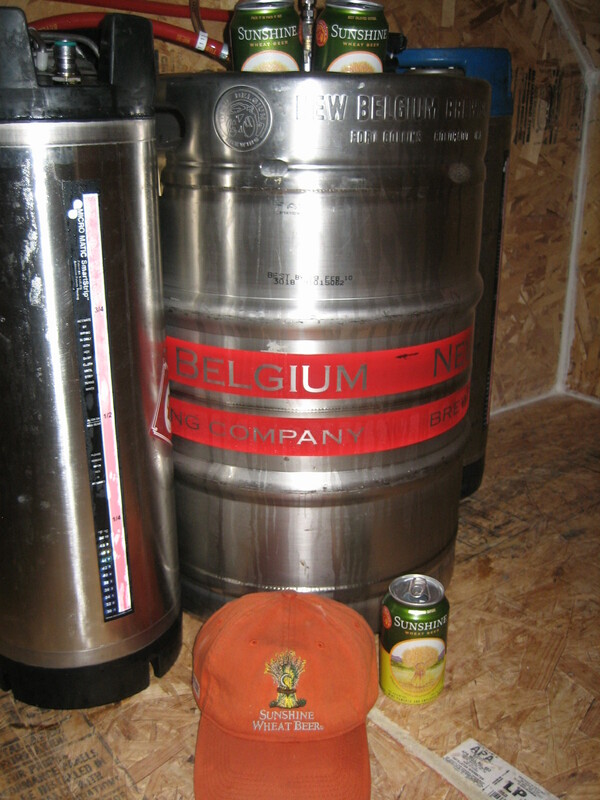 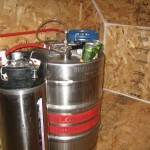 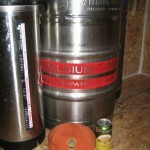 This way I can prove it is worth it to keep lots of beer on hand at all times. 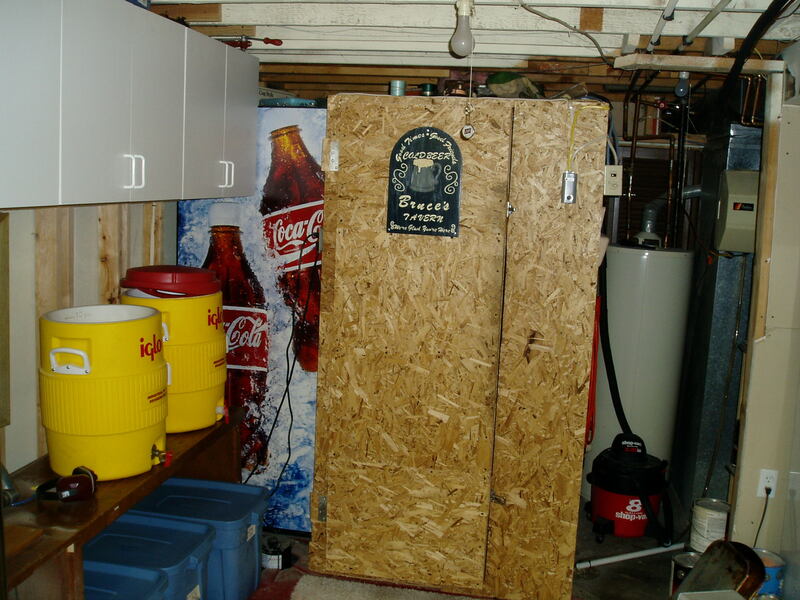 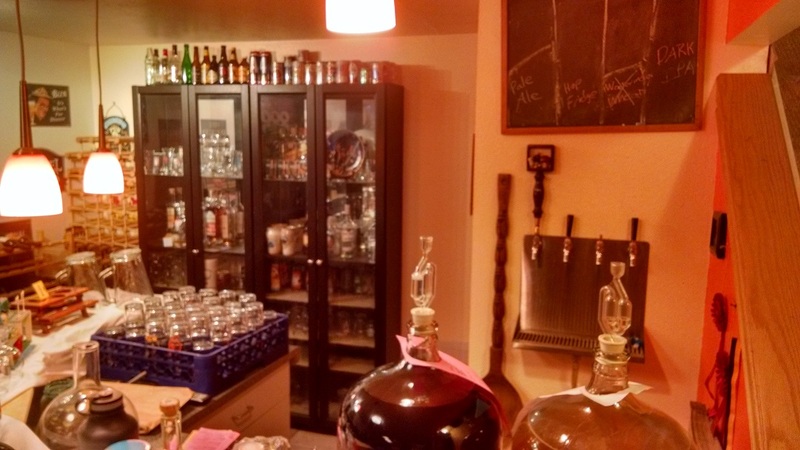 When we have a party, we like to have plenty of beverages on hand… we just don’t have the refrigerator room that we would like. 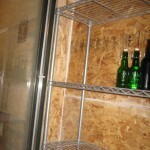 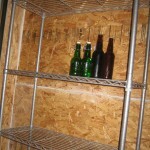 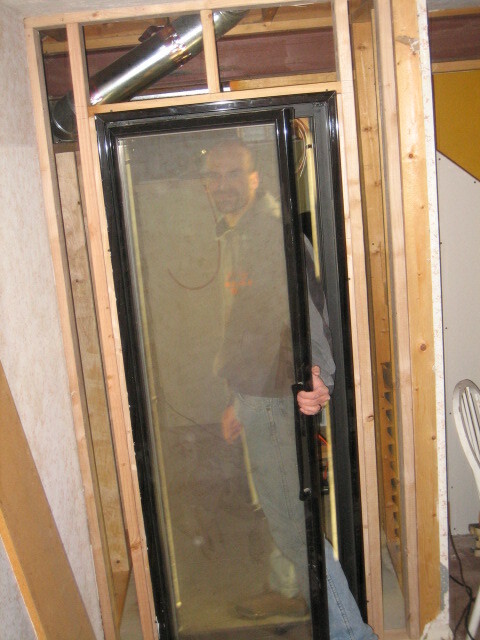 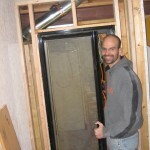 After visiting a couple of friend’s houses, we got the idea to build our own walk-in refrigerator. 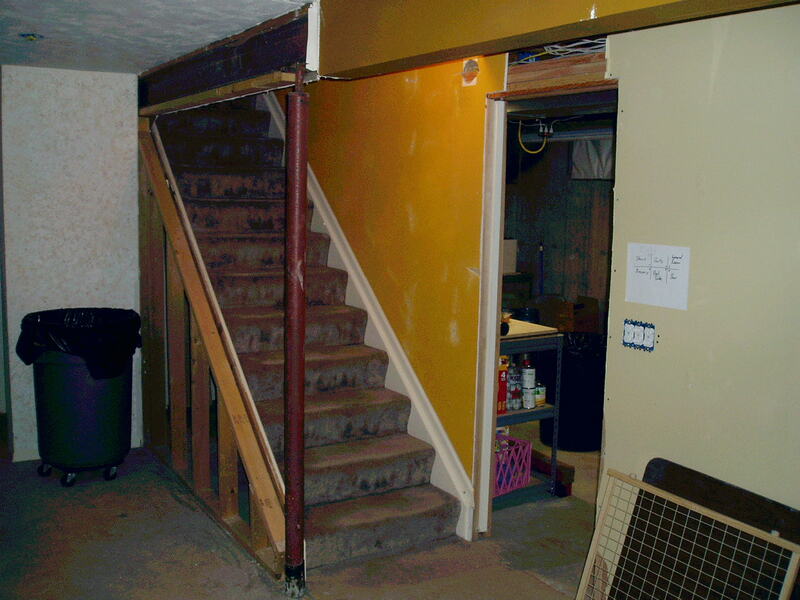 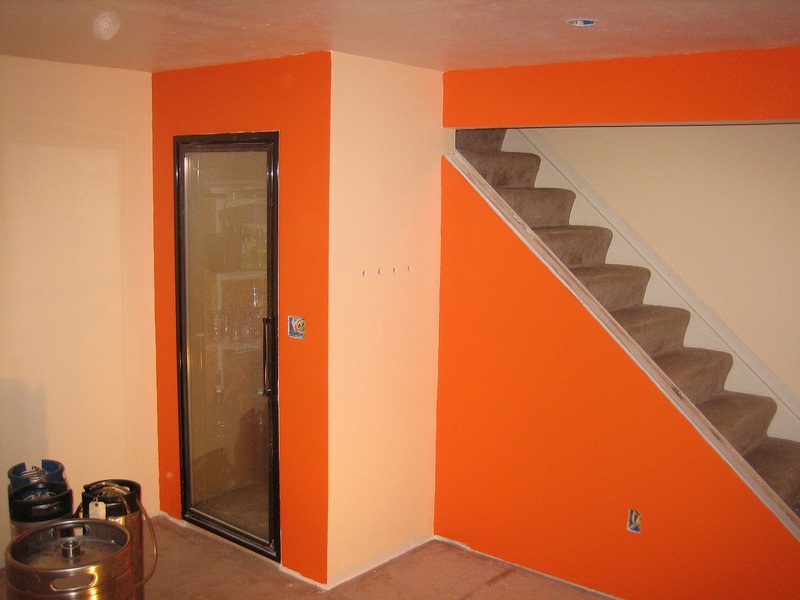 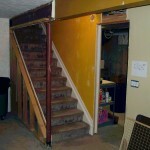 We decided to put the walk-in fridge under the stairs leading down to the basement. 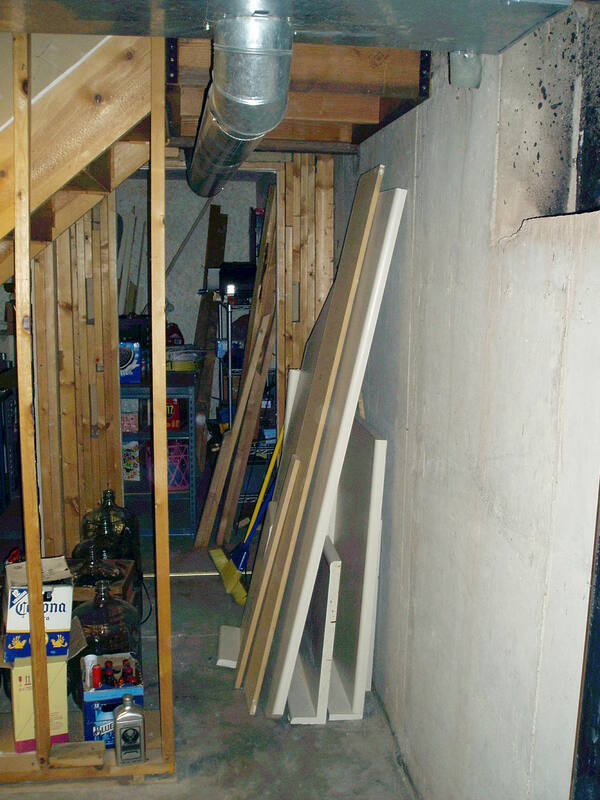 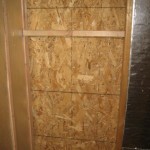 We are framing it out with 2×4 walls and insulating it with sheet insulation purchased from Home Depot. 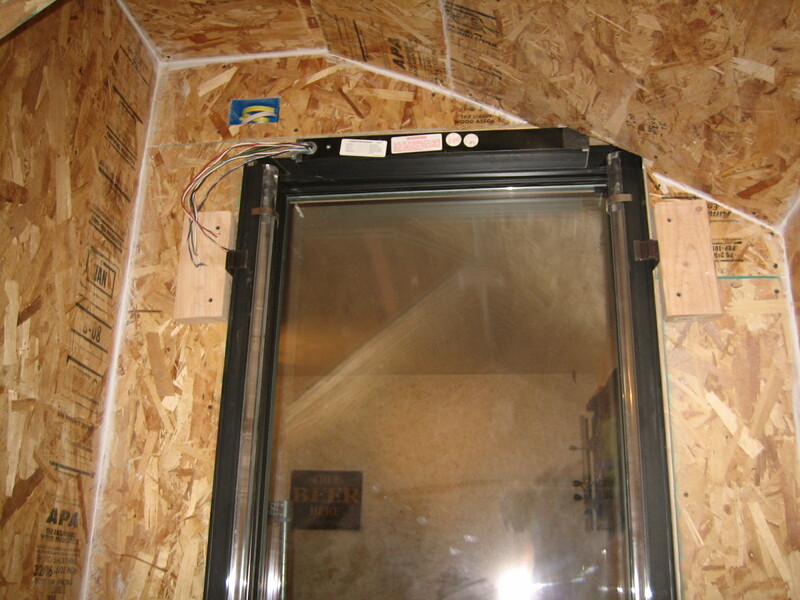 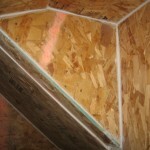 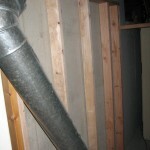 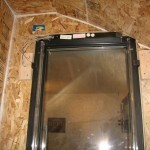 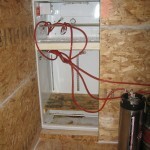 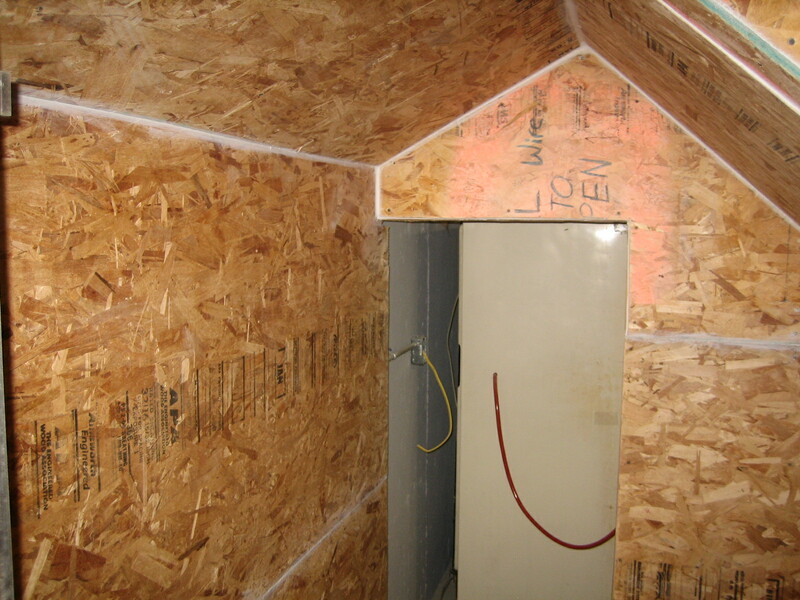 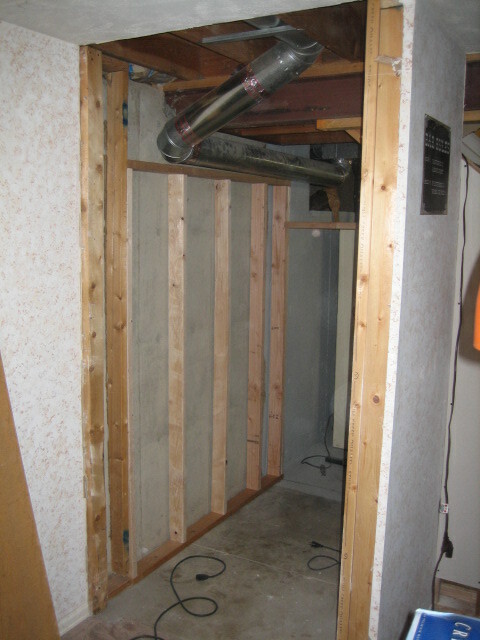 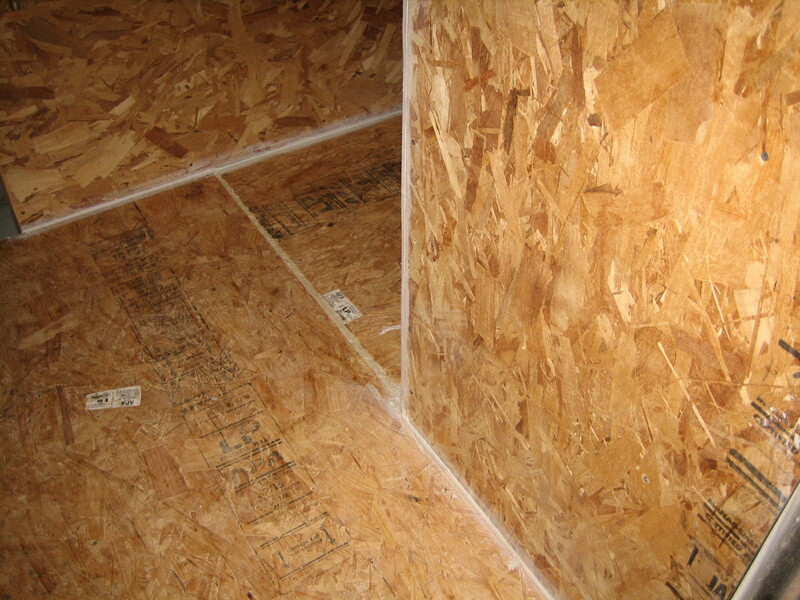 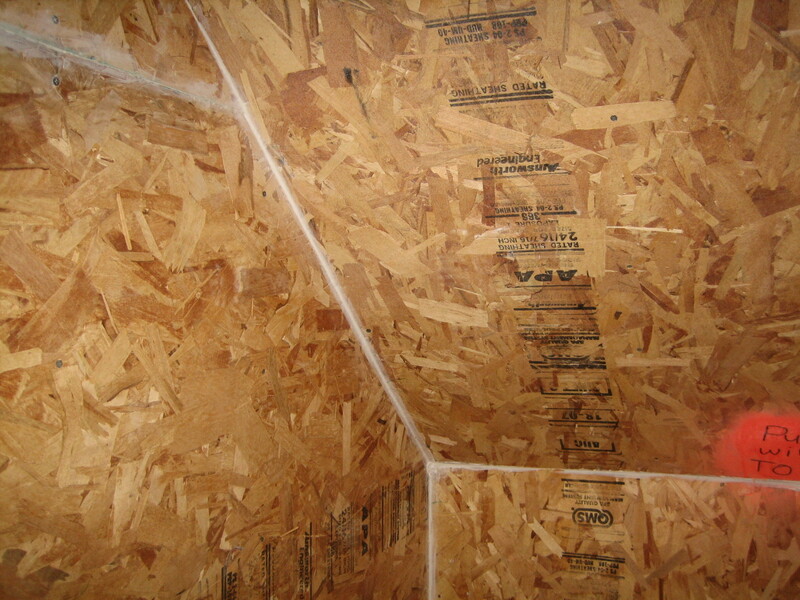 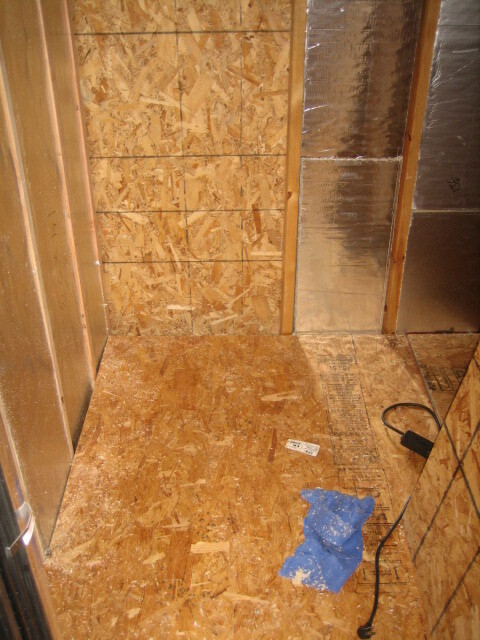 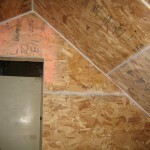 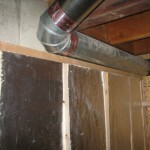 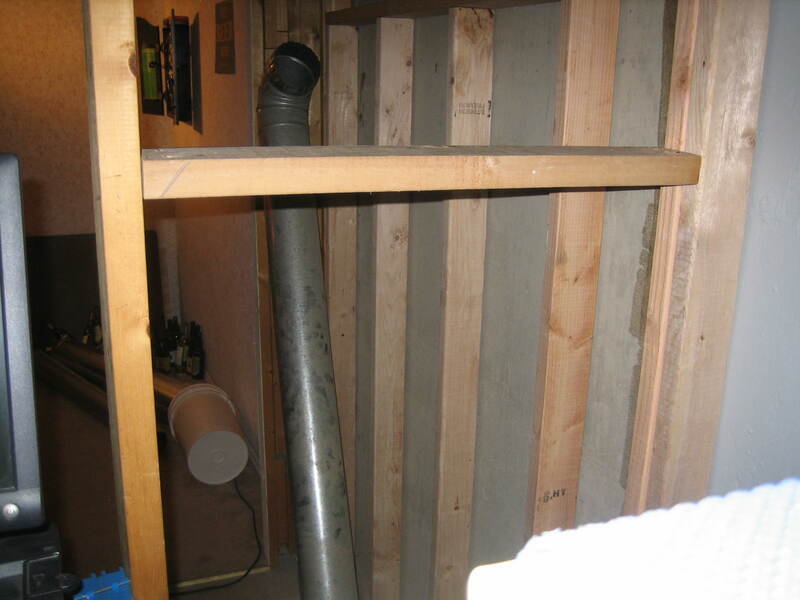 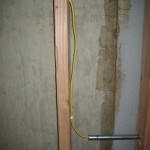 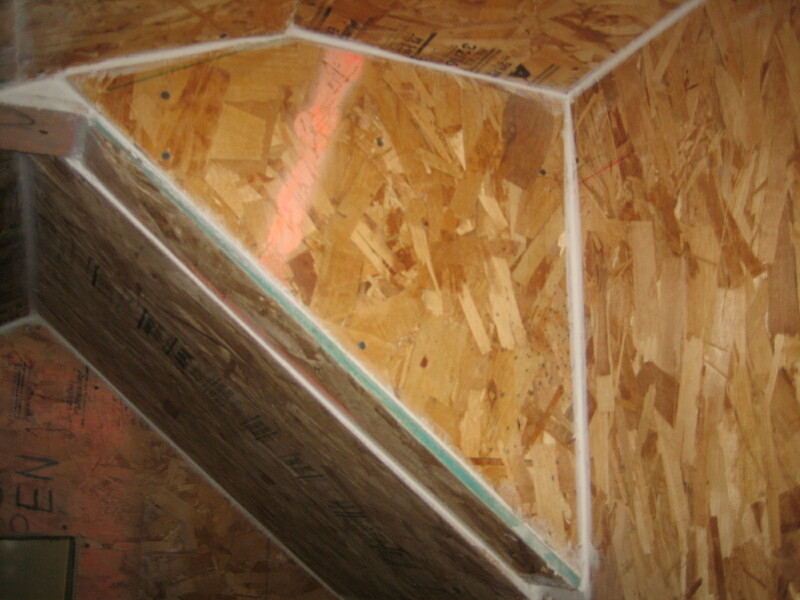 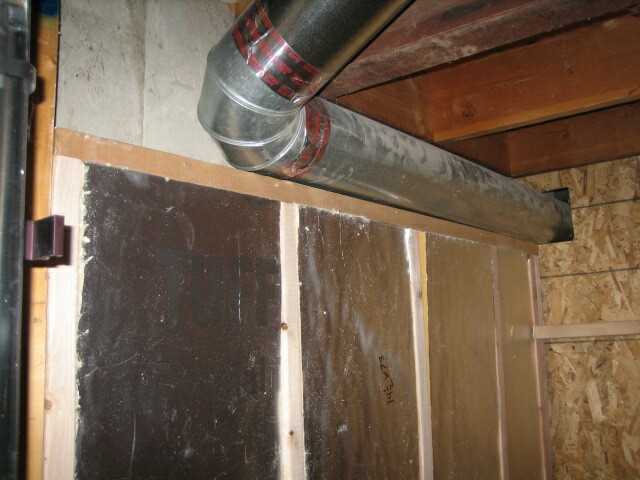 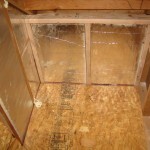 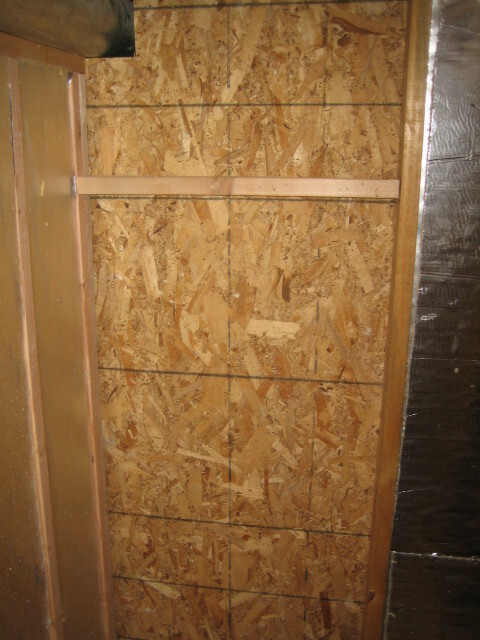 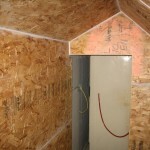 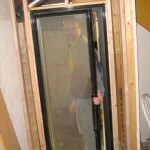 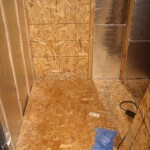 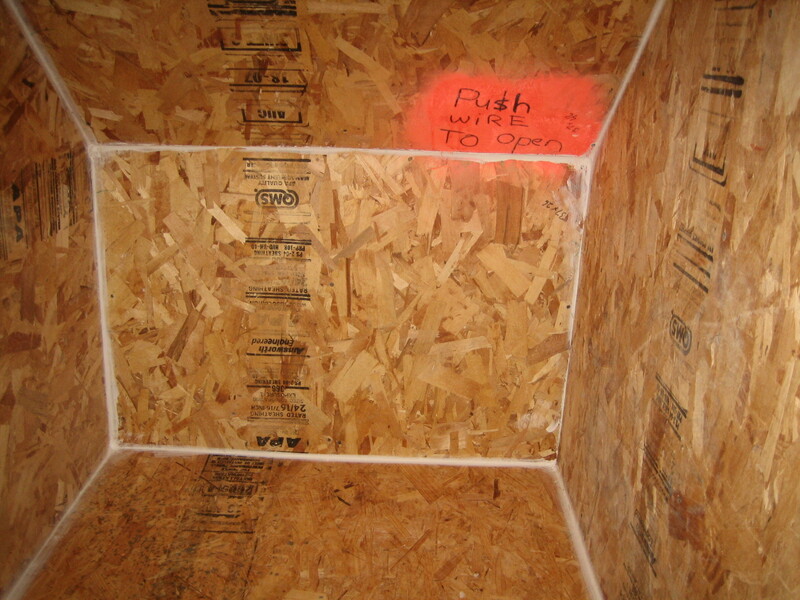 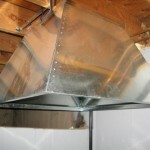 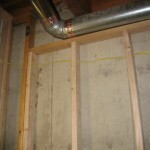 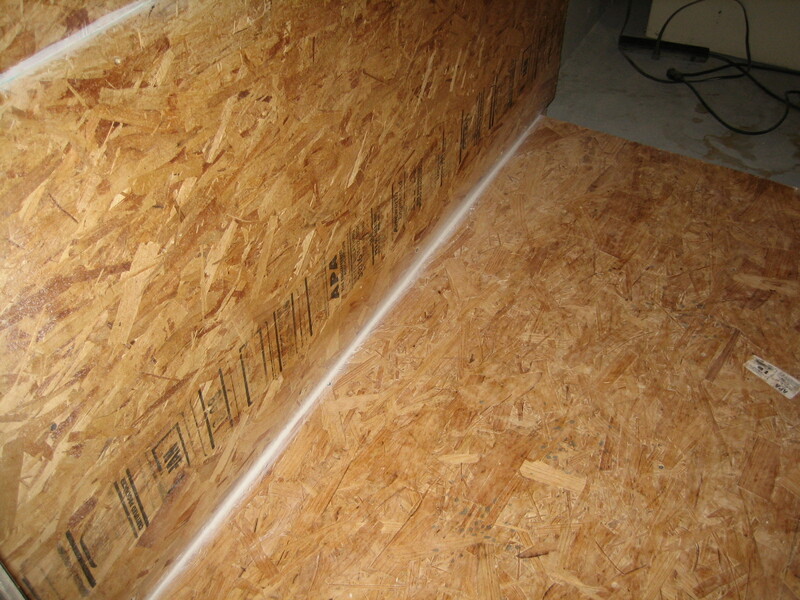 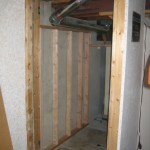 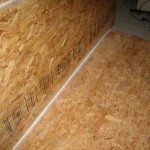 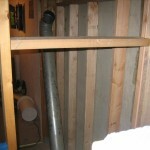 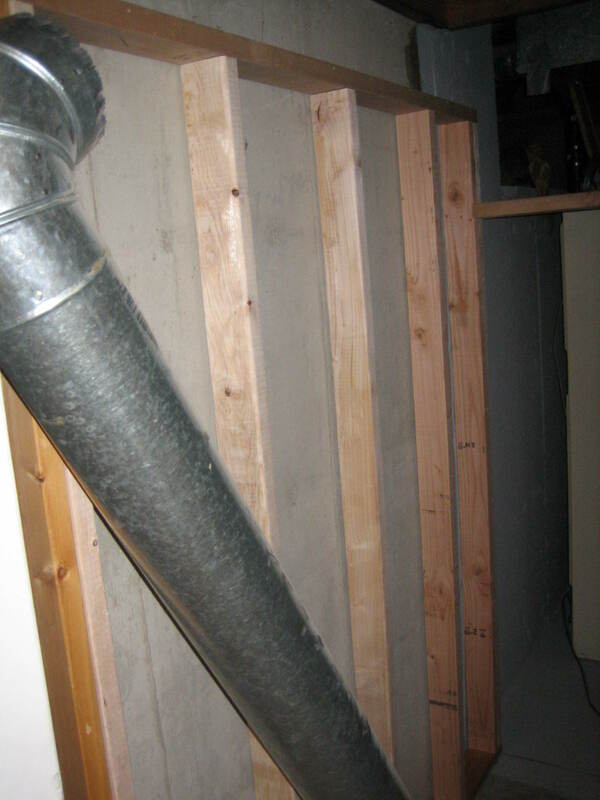 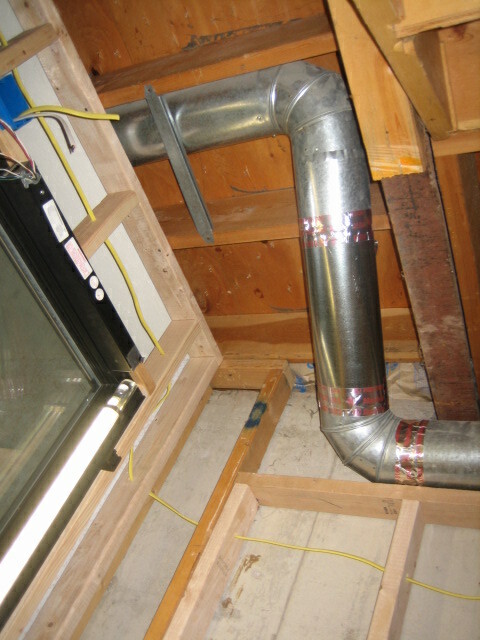 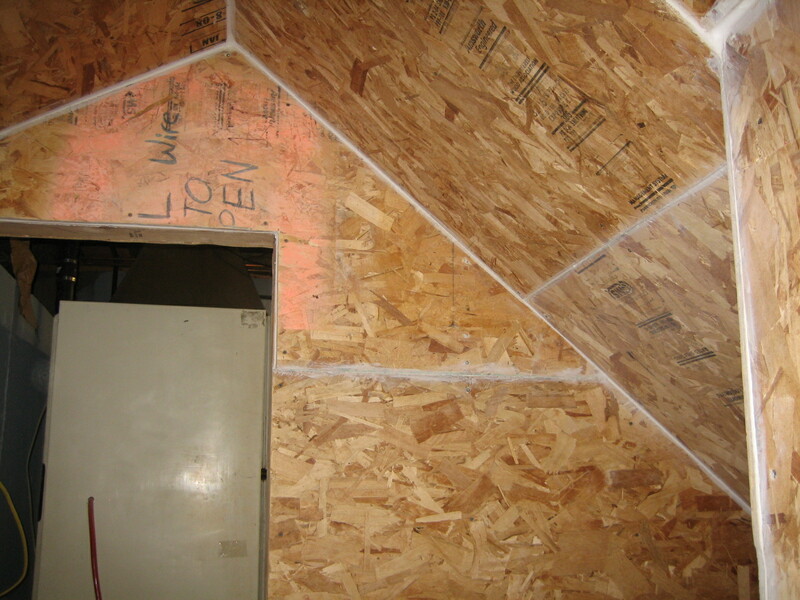 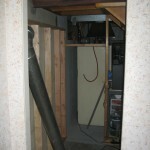 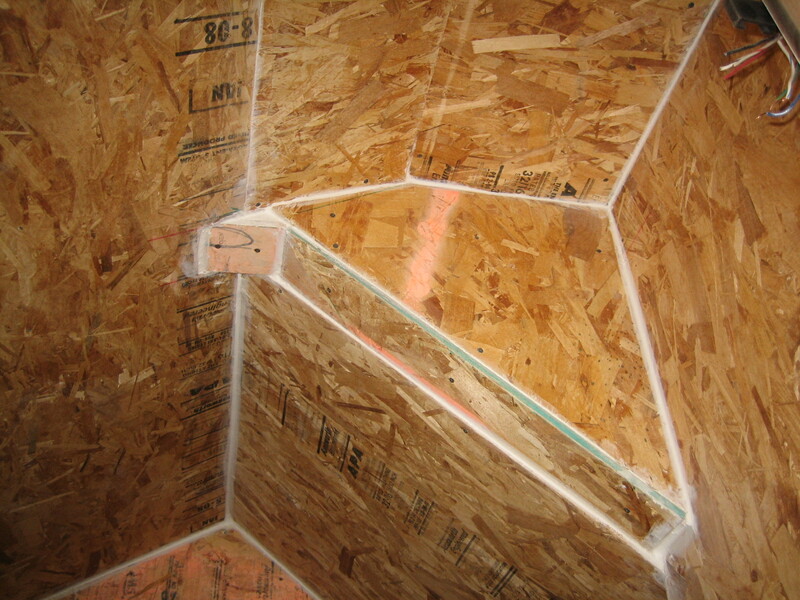 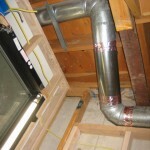 We are using both 2″ and 1″ insulation thicknesses to reach a total of 3″ of insulation. 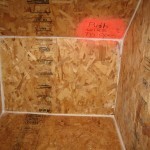 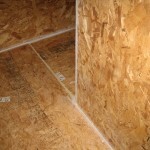 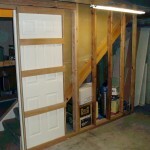 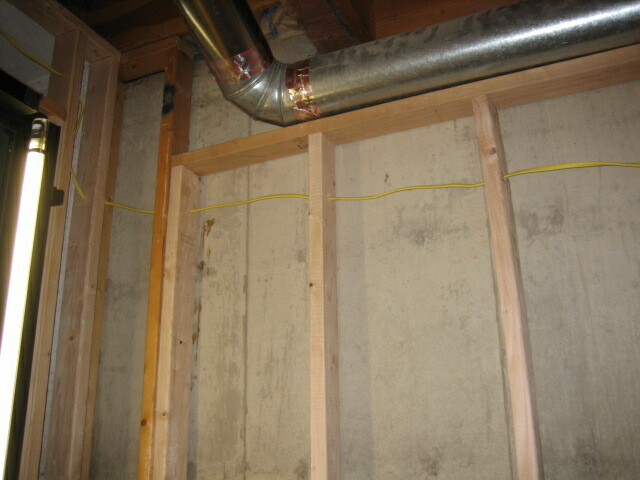 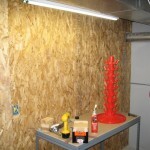 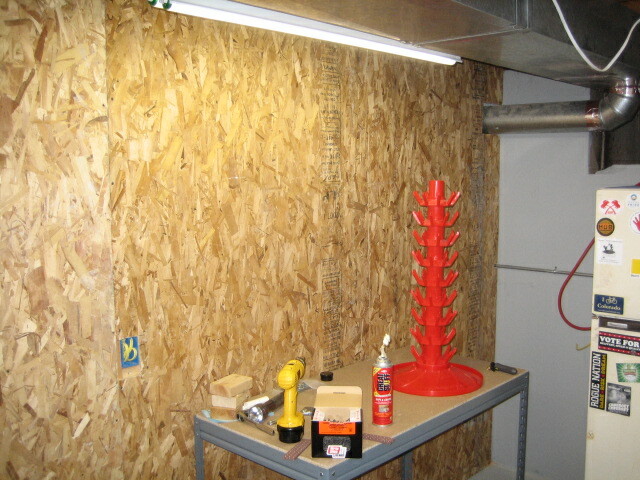 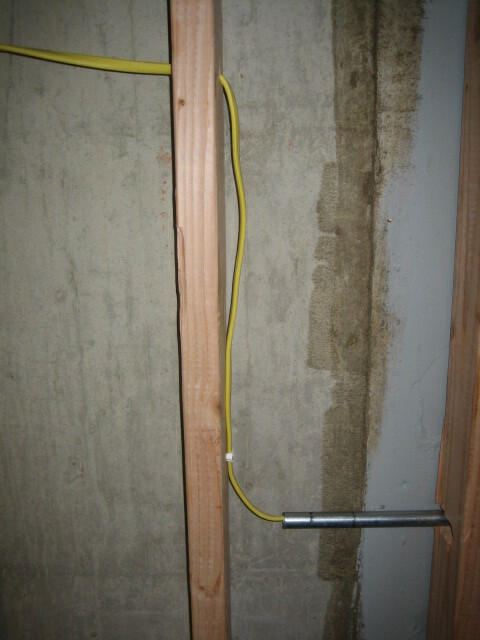 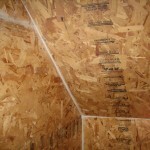 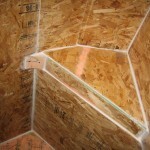 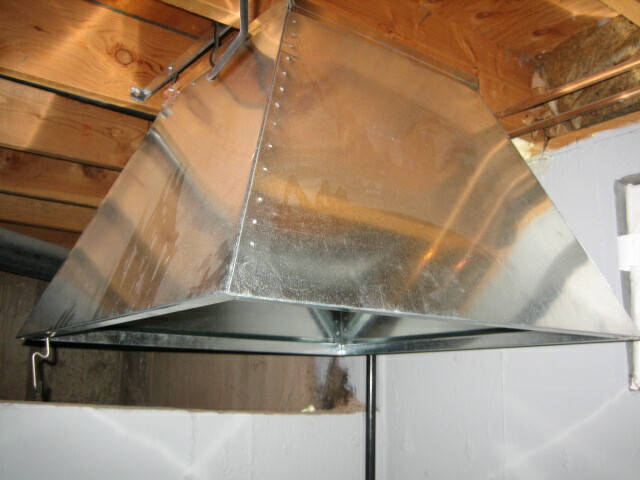 It has an R-Value of 6.5 per inch, so total R-Value of 19.5 or more when counting the plywood on each side of the walls. 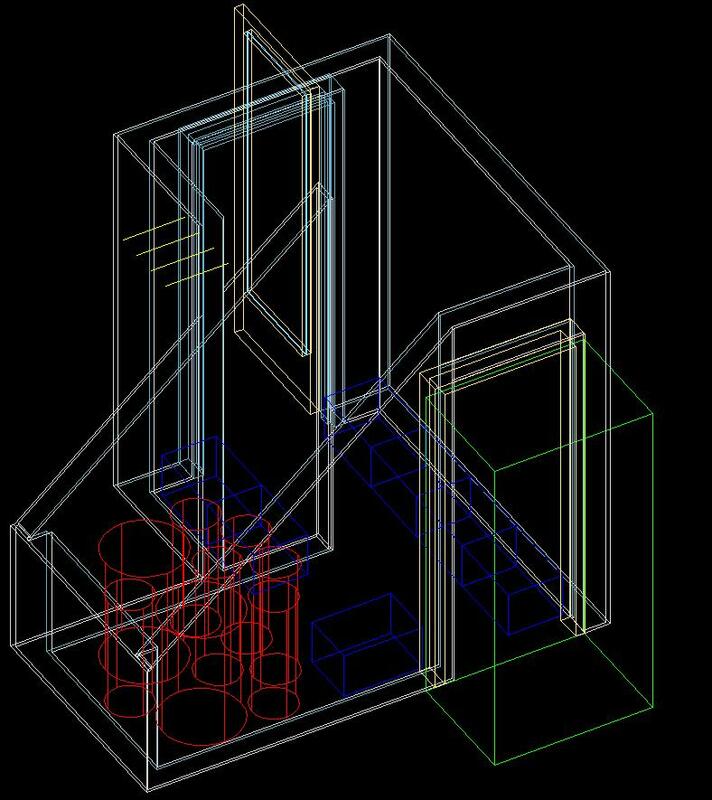 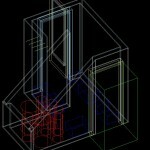 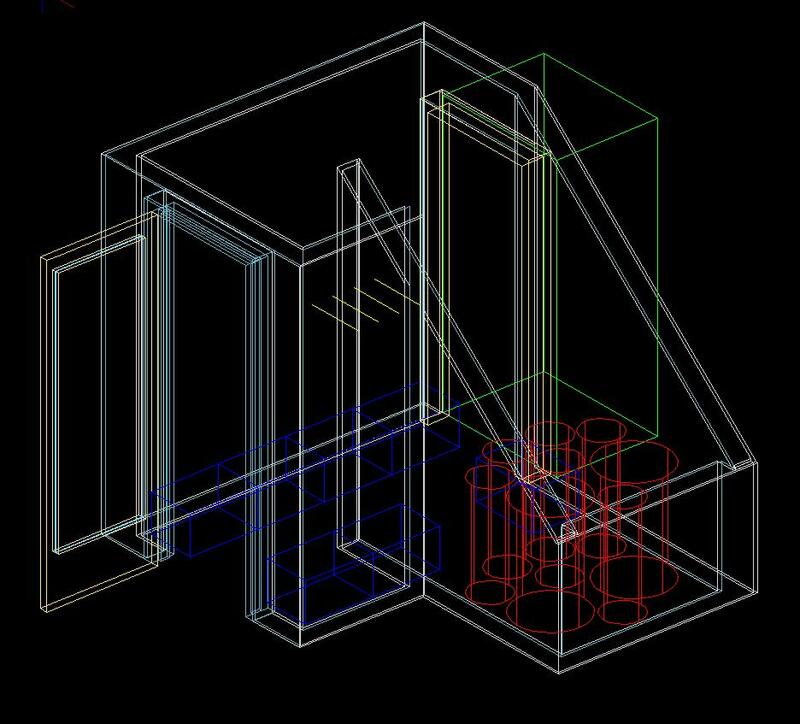 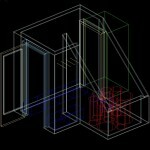 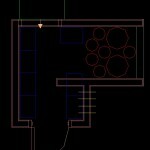 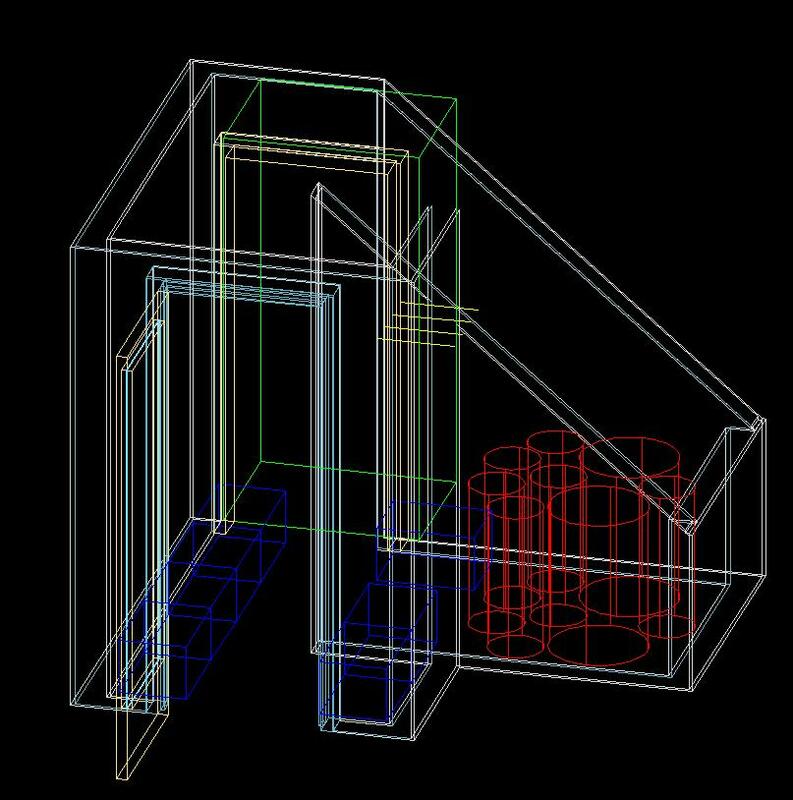 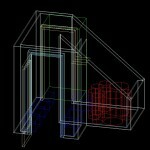 Here are some AutoCAD drawings of it… now in 3D!!! 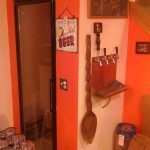 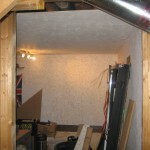 That wall that sticks out into the fridge isn’t really there; I just couldn’t get the slope right without showing it. 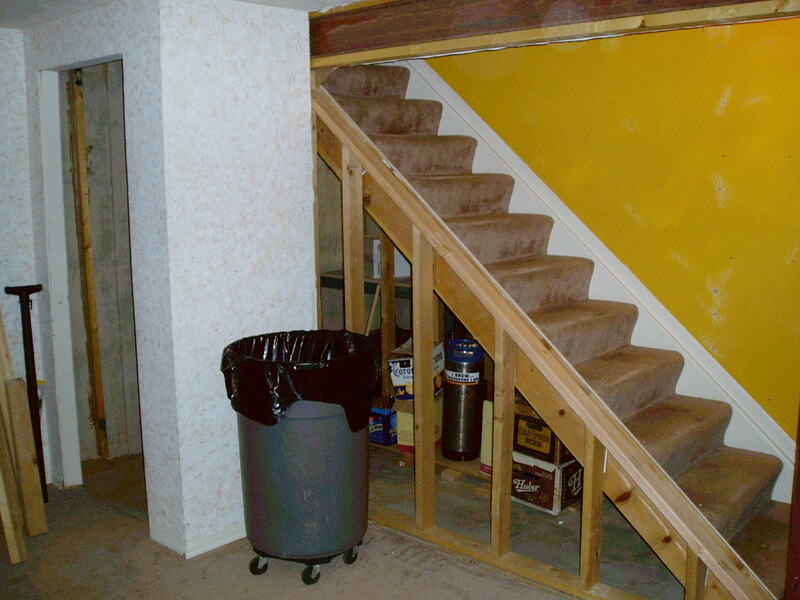 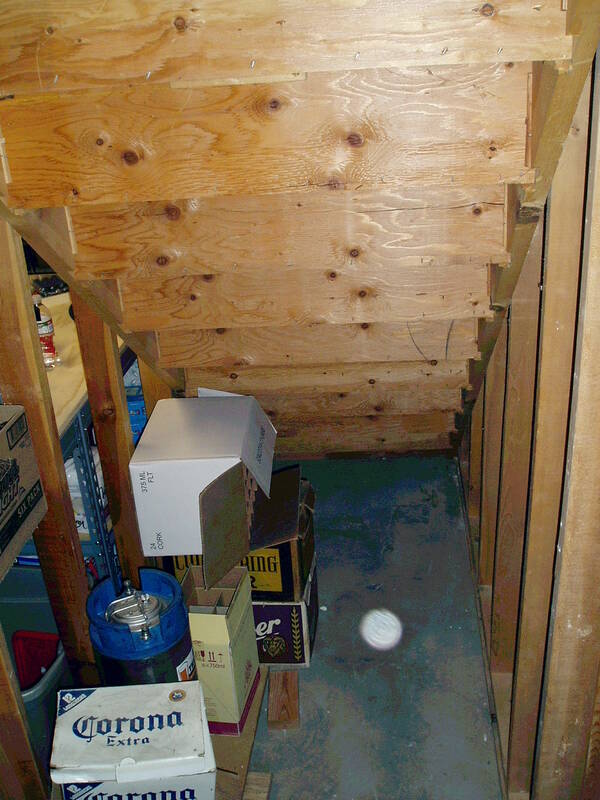 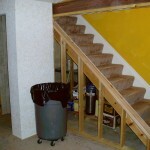 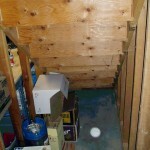 We are using the space under the stairs, the boxed out area next to the stairs was already like that when we got the house. 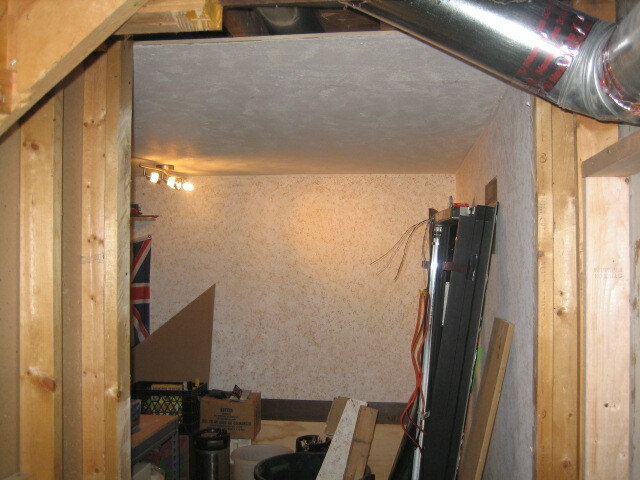 We added the pocket door which leads into the utility room (our brewery) and ripped down the wall on the side of the stairs. 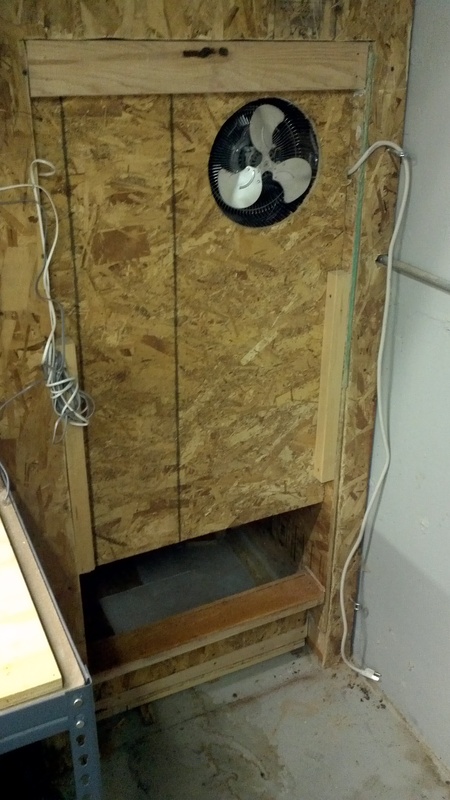 Took down the heater vent, and had my HVAC buddies move it to the side. 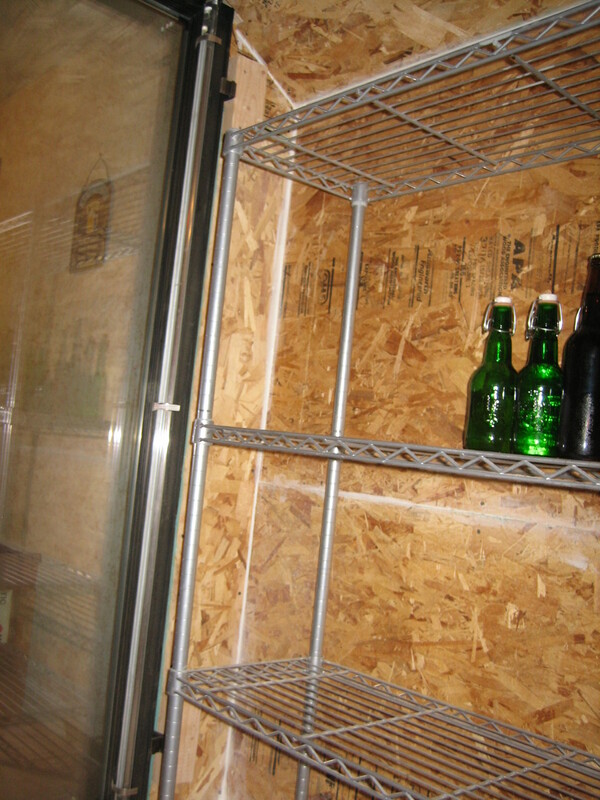 Framed out wall and added a stud to mark top of opening where the refrigerator unit that will be used to power the walk-in is going to go. 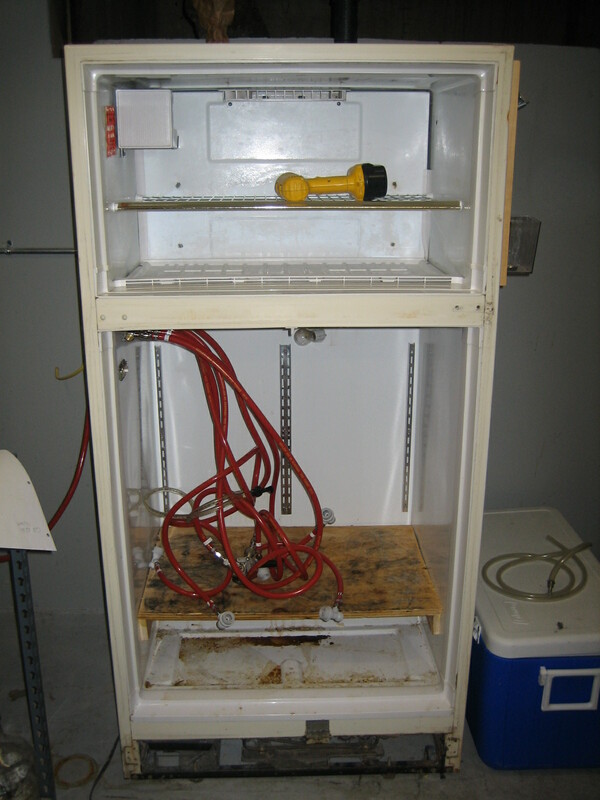 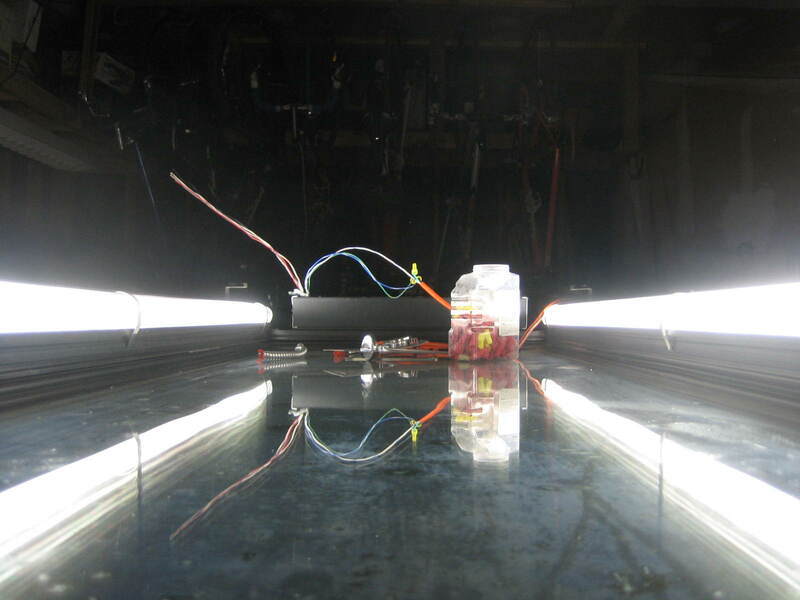 This is the fume hood that they made for us to go with our awesome burner. 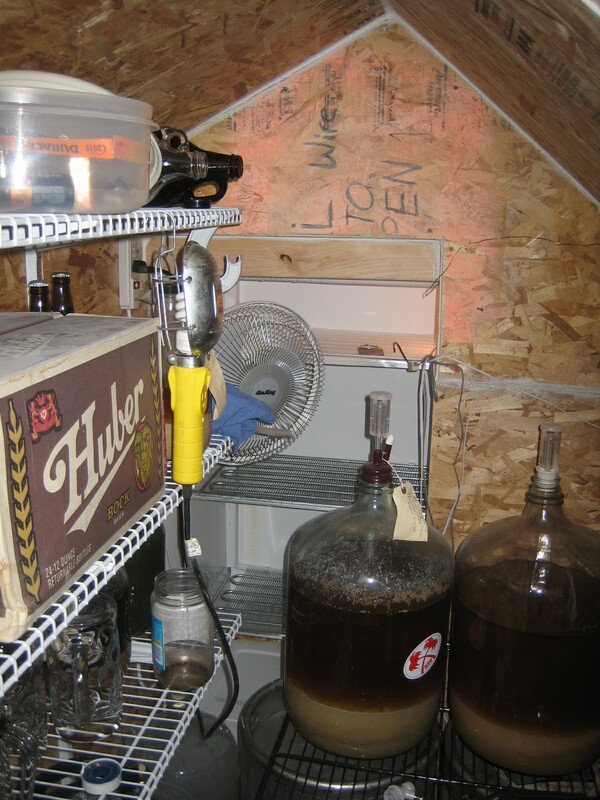 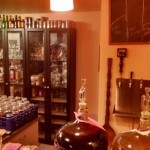 In return for this work, we taught them how to brew their own beer. 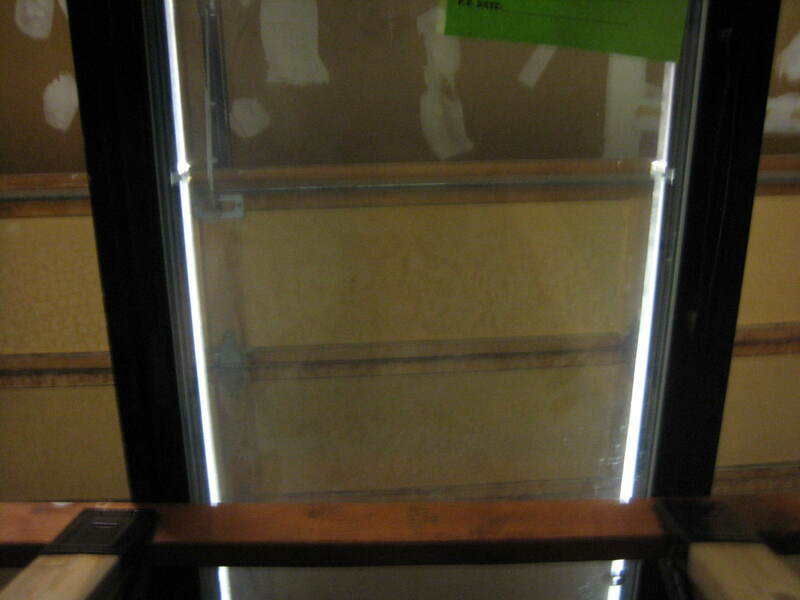 We are regular customers at a local restaurant supply store and found this reach-in refrigerator door. This is the kind used to hold sodas at your local convenience store. 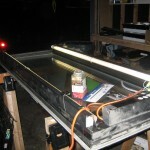 It is just the right size for our needs and even includes working lights! 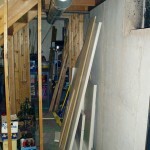 The original wall that was here was solid 2x4s stacked on top of each other. 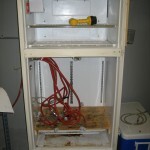 We decided that it would be better to rebuild it and start over. 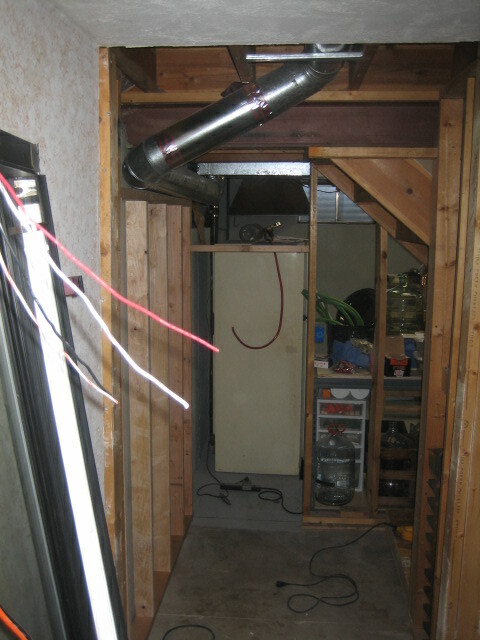 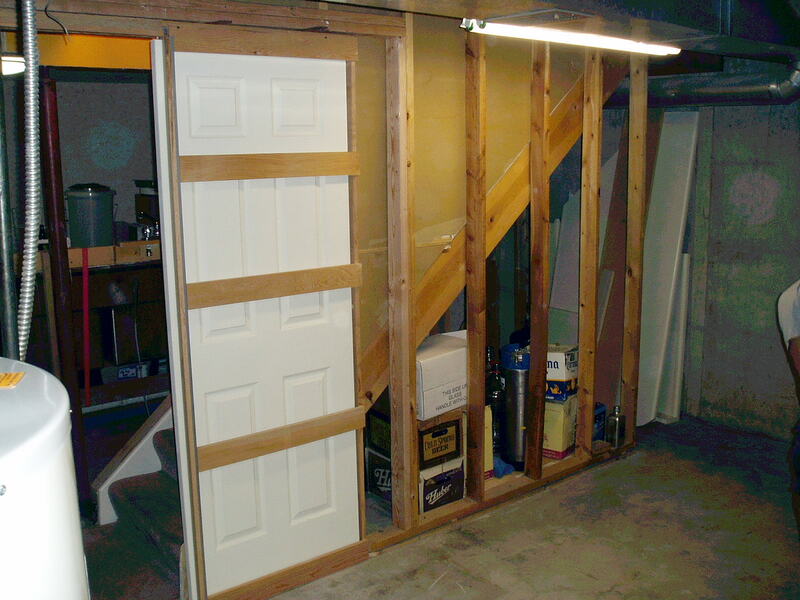 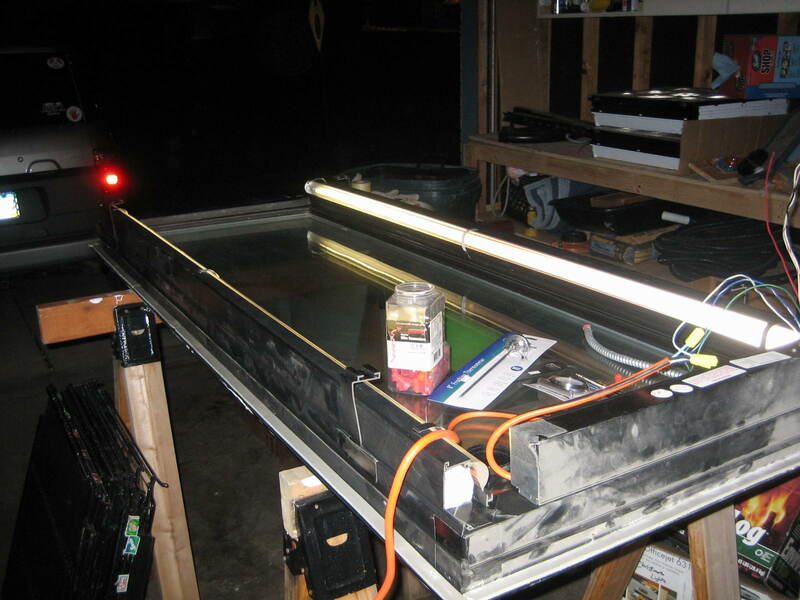 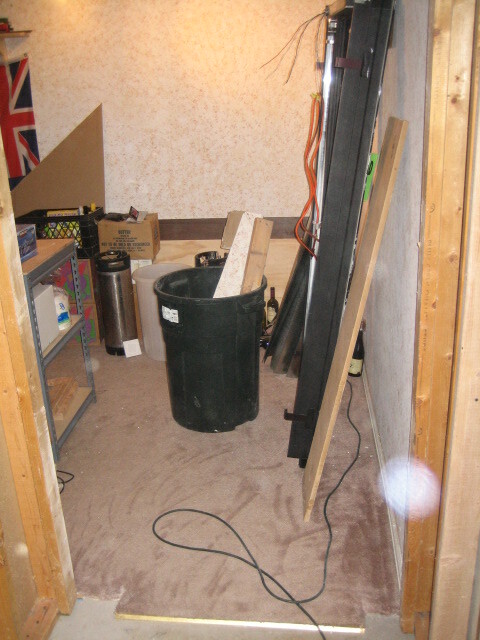 The power will come down from the garage where I am going to have a subpanel installed, go into the outlet for the fridge motor, then run though the walk-in walls to the switch just outside the glass door, then backup to the power pack for the door lights. 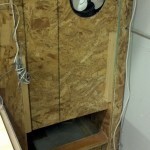 There will be a hole cut out for the fridge to go up to. 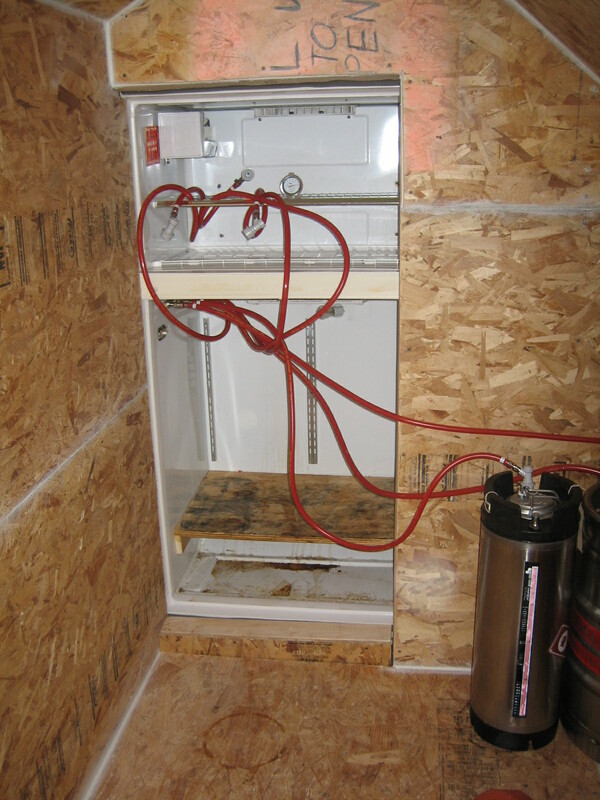 The fridge that is on the right side of the photo will be used: we will take the doors off and push it up to the opening, so you will be able to see inside the fridge from the inside of the walk-in. 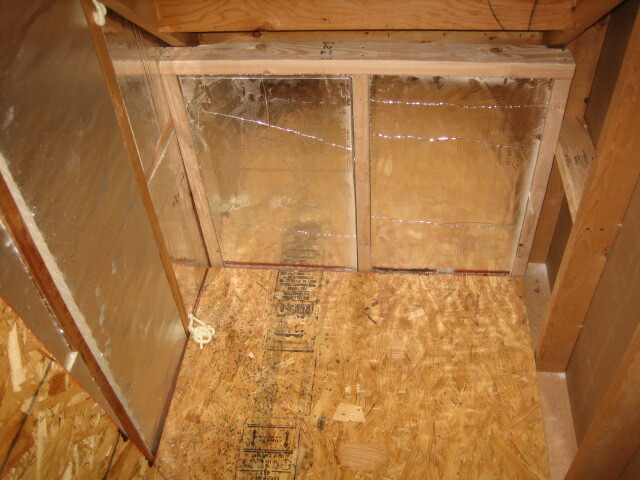 Finished layering the inside with plywood, and then caulked all the seams. 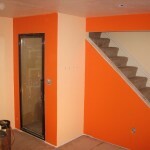 Decided to use basic painters caulking, since I had a lot of it on hand. 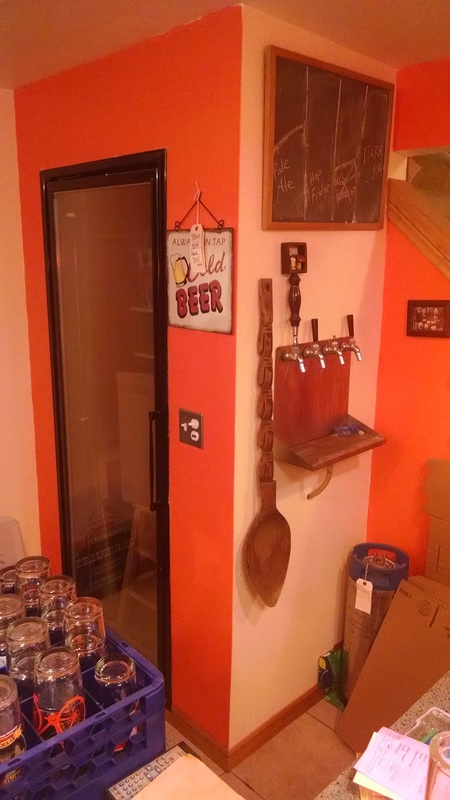 Took the doors off of the fridge I am using to power the walk-in, added a weather strip all around the fridge edge (not pictured) then moved the fridge up to the opening and strapped it in place. 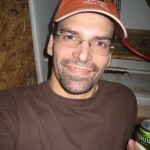 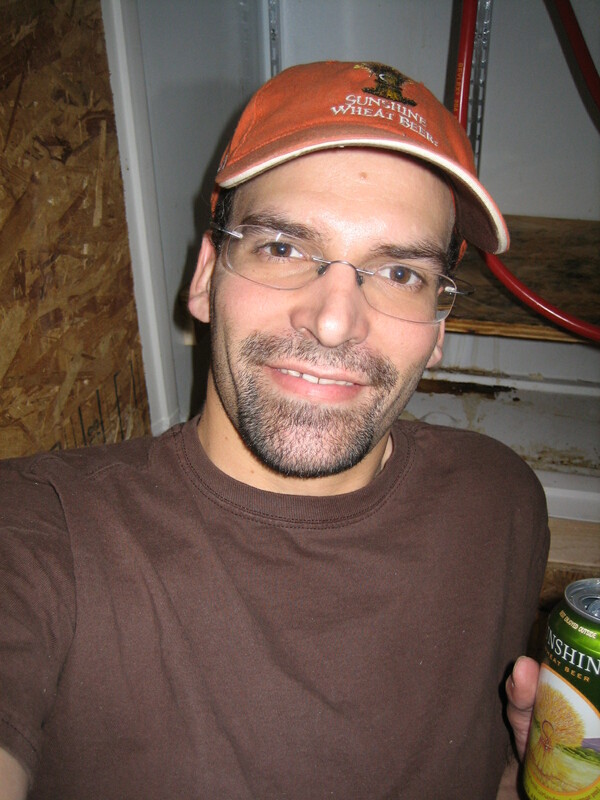 Some photos from the inside after I turned it on… and finally me enjoying a nice cold beer in the coolest room in the house.